The high level of support in the upper makes sure that the foot stays in place and gets enough ventilation. The Bushido features an internal slip-on construction for a more sock-like feel. Moderate cushioning is handled by the Compression Molded MEMIex mid-sole. Protective components add a layer of anti-debris mechanics that function well on soft and hard surfaces. Many were impressed by the FriXion XT, a sticky compound that holds onto many types of terrain. The Impact Brake System reliably provides traction when climbing and going down paths. The Bushido has a moderately heavy weight. Some reviews noted that the TPU Toe Cap was not as efficient as advertised because they still felt the hard surfaces pound their toes. Some runners thought that the heel cup needed improvement in order to prevent slippage. 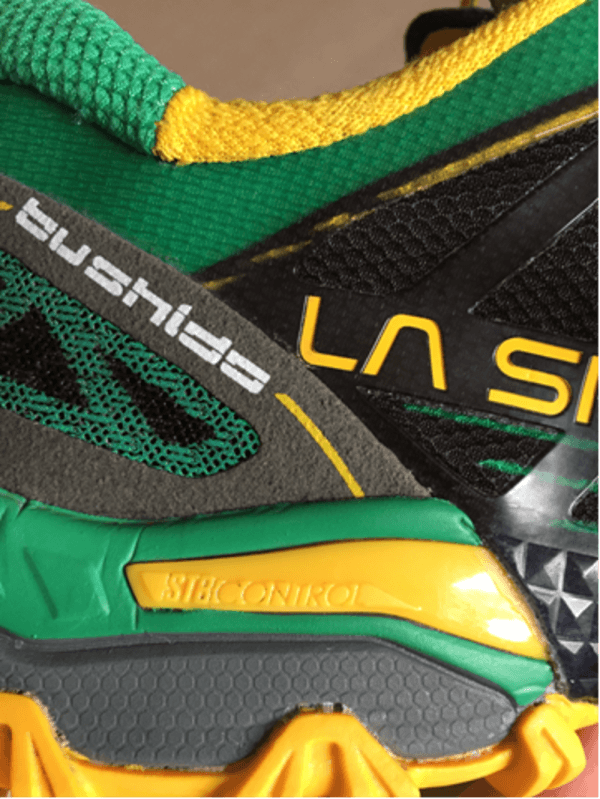 The La Sportiva Bushido is a running shoe that offers a perfect combination of responsiveness, stability and comfort. You can expect adequate protection and traction from this shoe, especially when running on technical terrain. This is great for daily training and long distance runs. I bought these back in November 2016 and only took them out for my first run in January this year. I purchased these having a specific race in mind that I was hoping to use them for – the Transgrancanaria 125k, which has an elevation profile of more than 8000m and is known for its technical and rocky volcanic mountain terrain. With the race taking place at the end of February, time was running out for me take the Bushido out for some test runs and to break them in. Big in my decision to go with La Sportiva in general for mountain running, and Bushido in particular for technical terrain. But of course we all have to find out for ourselves. So off to the trails of North Downs Way just to the south of London I went, retracing the route of the 7.5 mile Boxhill Fell Race. The terrain was muddier and flatter than what I'd find in Gran Canaria but it'd have to do. As I laced them up and got going, the words "bomb-proof" and "tank-like" came to mind. Militaristic for sure, but apt for a model named after the way of life of Japanese samurai warriors. The fit was precise and the footing secure, in all but the sloppiest mud where nothing short of spikes will do anyway. Out of the box the shoes feel stiff, augmented by the hard moulding around the midfoot, but this doesn't hamper the gait in any way. I did experience a bit of heel slip on the right foot which led to my ankle sock being "eaten" into the shoe. I wasn't too concerned though, knowing that my right foot almost always takes longer to adapt to a new pair of shoes due to its narrower heel, and the problem was fixed by tightening the laces a touch. the Bushido felt fairly well-cushioned on tarmac sections. The next couple of runs over the weeks leading to Transgrancanaria were also mostly on soft terrain, with some sandy and rocky stretches. With the longest run at 20 miles, the shoes felt comfortable enough and broken in enough that I headed to the race armed with only these and without a back-up as I normally do. Gran Canaria is part of a 7-island archipelago sitting off the coast of West Africa. Due to its mountainous profile which peaks out at just under 2000m near the center and prevailing North-easterly trade winds, the Northern half of the island tends to be wetter and more lush than the South, which is barren, dry, and rocky. Transgrancanaria starts at the fishing port of Agaete in the North and ends at beach resort of Maspalomas to the South. In between is 125km of hills, stream crossings, mud, cobble stone, loose rock, scree, and dusty single track. Perfect testing grounds. I finished the race in 25 hours 35 minutes, fairly comfortably within the 38-hour cutoff. I felt comfortable and confident throughout in the Bushidos and was particularly thankful for the robust toe protection for each of the dozen or so times that I kicked a rock. I did slap on a Compeed blister plaster on the ball of each foot around the halfway mark but this was more of a preventative measure than due to any actual blisters. To be sure, a blister or two would not be of surprise to anyone given the harsh, dusty terrain but I'm happy to report that the feet came away unscathed, which I believe owe as much to the snug wrap-around fit of the Bushido as anything else. In sum, I'd happily turn to these again for mountain running in varied conditions and terrain, with bias towards dry and with loose rocks. Prior to starting Transgrancanaria I felt as if I was heading into battle. With Bushidos at my side, I not only emerged alive but feeling victorious! One of the best toe caps we've ever seen protects your toes so they can live to see another day while laughing of your clumsy rock kicks. I think for a midweight, low profile shoe that you can really just hit some aggressive terrain and feel confident in the steps you're gonna take, La Sportiva really hit the mark with this. La Sportiva aims for the middle of just about everything in the Bushido. It bridges the needs of runners on opposite sides of the minimalist and traditional kind of shoe spectrum. The Bushido has excellent cushioning for a shoe with 19mm heel height and 6mm heel drop. It is not the lightest shoe but runs nimble in even the rockiest and most technical trail. The responsive platform enables runners to blaze the trail with sufficient support and protection. While it may not be the most flexible trail shoe, it does offer an element of natural running that a large number of runners will love. La Sportiva, however, goes all out in providing superior traction in this shoe. The outsole is heavily littered with very aggressive lugs, including the perimeter. La Sportiva’s own rubber compound only makes the grip even more spectacular. It is also a very stable shoe without the usual TPU insert in the midfoot and offers a very balanced platform, even when running on uneven or rocky trails. The Bushido is an extremely versatile shoe as its geometry and design allow it to be a spectacular speed training demon or a high-mileage trainer. Regardless of the distance or the speed, the sock-like fit of the upper and lockdown feel all throughout the shoe provide runners with confidence from the first to the last step. Like most La Sportiva shoes, it has a snug fit in the heel, the midfoot, and the forefoot. The snug forefoot offers just enough space to accommodate mid-run swelling. Usually, runners with narrow to medium fit are able to get the most out of the shoe. Medium is the available size of the Bushido. Sizes come in 7-15 for the men’s and 5 to 11 for the women’s. The extremely sticky Frixion ST covers most of the outsole, except in high-wear areas as these are filled with the durable carbon rubber. A single glance at the outsole will impress even the most serious observers. The outsole features really prominent and utterly aggressive lugs. These lugs dominate the outsole, even the perimeter. Loose rocks, going up or down a hill, and technical trail running will all be a breeze in this shoe. The full-length midsole called the Memlex is basically La Sportiva’s own version of a compression molded EVA for enhanced durability and responsive cushioning. Protection on the trail against bruises due to sharp objects is amply delivered by a Rock Protection Plate in the forefoot. This protection plate helps runners who want a stiffer form for powerful takeoffs. Covering the upper in superior breathability is an open air mesh. The excellent ventilation of this shoe should ensure a sweat-free and really cool ride. Part of the protection on the trail is the TPU toe cap, which quite flexible despite being ultra-tough. The Brooks Caldera 3, on the other hand, uses a unique mesh material that has an additional feature of water drainage. The STB Control or the smart and strategic use of new synthetic overlays enables runners a more luxurious and comfortable fit.